Congenital seminal vesicle cyst with ipsilateral renal agenesis, vascular anomalies and intestinal malrotation. Differential diagnosis: müllerian duct cyst, ejaculatory duct cyst, diverticulosis of the vas deferens, ectopic ureterocele and abscess. 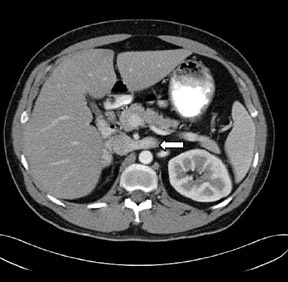 CT of the abdomen and pelvis revealed absence of the right kidney (Figure 1) with compensatory hypertrophy of the left kidney. The liver, spleen, gallbladder and the adrenal glands had an unremarkable appearance. 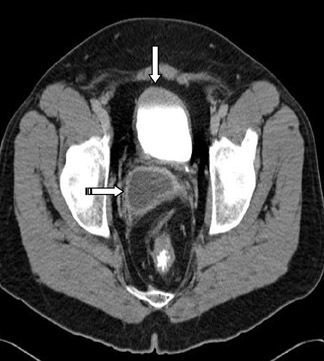 A cystic structure measuring approximately 5.6 cm × 3.2 cm was noted at the base of the urinary bladder, in the right seminal vesicle, consistent with a seminal vesicle cyst (Figure 2). Incidental note was also made of double inferior vena cavae (Figures 1 and 3) and transposition of the superior mesenteric artery and superior mesenteric vein axis with associated intestinal malrotation. There was also abnormal arrangement of the small and large bowel, with the small bowel predominantly in the left half of the abdomen and the large bowel in the right half of the abdomen (Figure4). Cysts of the seminal vesicles >12 cm have been termed “giant” cysts. Seminal cysts may be congenital or acquired.5 The congenital cysts are usually unilateral with no predilection for side.1 Acquired cysts are often bilateral and are seen in an older age group after a history of chronic prostatitis or prostate surgery. The differential diagnosis of cystic pelvic masses in the male includes müllerian duct and ejaculatory duct cysts, both of which aremidline in location. Other possibilities include prostatic cysts and, more lateral in location, diverticulosis of the vas deferens, ectopicureterocele and abscess. The presence of spermatozoa in the cystic aspirate differentiates the seminal vesicle cysts from the müllerianduct cysts. The inferior vena cava (IVC) is formed by the successive development and regression of 3 paired veins. During early embryogenesis,the posterior supracardinal and more anterior subcardinal veins are formed. Later the most caudal segment of the right supracardinal veinbecomes the infra-renal vena cava. 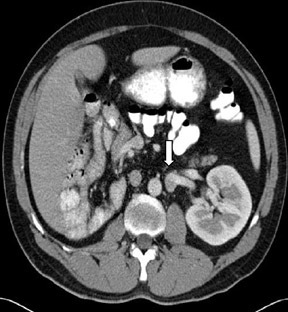 The middle segment joins with part of the right subcardinal vein to form the renal portion of the IVC. The cephalic portion of the IVC is formed from the efferent veins of the liver. The portion of the right supracardinal vein cephalad to the kidneys becomes the azygos vein; similarly, that portion on the left forms the hemiazygos system. The rest of the left cardinal system undergoes involution. Interruption of normal regression of any of these venous structures results in different anomalies. Duplication ofthe IVC involves the infrarenal segment. Several imaging techniques used in the evaluation and differentiation of pelvic cystic masses include excretory urography, ultrasound,CT and magnetic resonance imaging. Congenital cysts of the seminal vesicles are uncommon and usually unilateral with no predilection for side. There is an association between congenital seminal vesicle cysts and ipsilateral renal agenesis in two thirds of cases, and this can be explained by their common embryologic origin. Zinner first described them in 1914.1 Congenital cysts of the seminal vesicles usually become apparent in the second to third decades during the period of greatest sexual or reproductive activity. Commonly reported symptoms include abdominal, perineal, pelvic and ejaculatory pain. Others include dysuria, urinary frequency, hematuria, urinary tract infections, infertility, hemospermia and, rarely, enuresis. 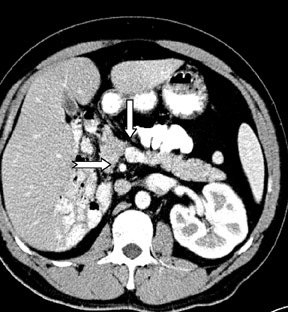 To the best of my knowledge, this is the first reported case of the association of congenital seminal vesicle cyst with vascular anomalies and intestinal malrotation. Livingstone L, Larsen CR. Seminal vesicle cyst with ipsilateral renal agenesis.AJR Am J Roentgenol. 2000;175:177-180. Rappe BJ, Meuleman EJ, Debruyen FM. Seminal vesicle cyst with ipsilateral renal agenesis. Urol Int. 1993;50:54-56. Heaney JA, Pfister RC, Meares EM Jr. Giant cyst of the seminal vesicle with renal agenesis. AJR Am J Roentgenol. 1987;149:139-140. Kenney PJ, Leeson MD. Congenital anomalies of the seminal vesicles; spectrum of computed tomographic findings. Radiology. 1983;149:247-251. King BF, Hattery RR, Lieber MM, et al. Congenital cystic disease of the seminal vesicle. Radiology. 1991;178:207-211. Moore KL. The developing human, 2nd ed. Philadelphia, PA: Saunders;1997:220-246. Okada Y,Tanaka H, Takeuchi H, Yoshida O. Papillary adenocarcinoma in a seminal vesicle cyst associated with ipsilateral renal agenesis: A case report. J Urol. 1992;148:1543-1545. Lee JK, Sagel SS, Stanley RJ, Heiken JP. Computed body tomography with MRI correlation. 3rd ed. Philadelphia, Pa: Lippincott, Williams and Wilkins;1998:1044-1045. 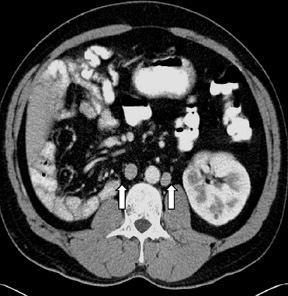 Congenital seminal vesicle cyst with ipsilateral renal agenesis, vascular anomalies and intestinal malrotation. Appl Radiol.